With the help of photos that replicate different types of colour vision deficiencies, NB Online finds out what colour blindness "looks" like, and what it’s like to live with the condition. People who have colour vision deficiency (colour blindness) find it difficult to identify and distinguish between certain colours. 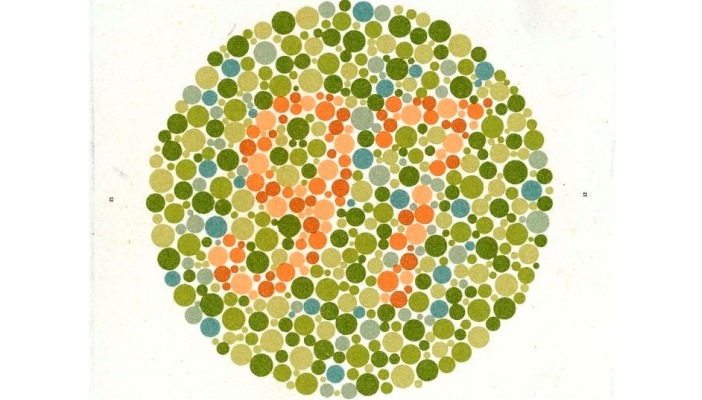 In most cases colour blindness is inherited, though it can be developed in later life if an injury is incurred. Worldwide, about eight per cent of men (1 in 12) and 0.5 per cent of women (1 in 200) have some form of colour vision deficiency (CVD) and about half of these have a moderate or severe condition. Those with an especially mild condition may not even be aware that they have it. Our perception of colour begins with light entering the eye and stimulating one of three cones (receptor cells within the eye). Each cone is sensitive to different wavelengths and pass on a signal to be processed in the brain. When all three cones are working properly, we have "normal vision". However, differences in how sensitive these cones are to light, or for people who have fewer than three cones, results in a range of different colour vision deficiencies. People who only have two cones, or whose cones are not as sensitive as normal, perceive colours differently depending on which ones are affected. The Colour Blind Awareness organisation have provided some great simulations to illustrate what the different forms of CVD can look like. The image here is a set of coloured pencils which illustrates "normal vision" - black, brown, green blue, violet, red, orange, yellow and white. Commonly known as red-green blindness, people with protanopia or deuteranopia have trouble perceiving red, green, brown and orange colours. This is the most common and well-known form of colour deficiency affecting about five per cent of men. The image shows the green pencils as shades of brown, the reds as shades of yellow and the purple and blue as difficult to distinguish. The most common colour confusions for people with tritanopia are light blues with greys, dark purples with black, mid-greens with blues and oranges with reds. The image illustrating the condition shows no yellow or green at all. This is a much rarer form and only about five per cent of the colourblind population have it. People with achromatopsia have no working cones in their eyes and so do not perceive any colour at all. For them, everything appears as shades of grey, as illustrated in the image. This is an extremely rare form of CVD with only about one in 33,000 people living with it. If you want to read more about achromatopsia, Radhika Holmstrom explored the condition in depth for NB Online last year. For many people with CVD, life isn’t too different to the lives’ of people without the condition. It is not regarded as a disability in the UK. People tend to get used to having it over time and it rarely gets worse, though if it does they should see their optometrist. That is not to say there aren’t difficulties that arise from the condition. For example, being able to tell when food is ripe or cooked is something that people without CVD might take for granted. Arguably, the most significant impact of CVD is related to education. Research suggests that about 80 per cent of children with CVD enter secondary school without knowing they have the condition. The widespread use of colour in teaching materials can lead to unsupported children falling behind in class, or becoming frustrated. Identifying whether a child has CVD at an early age can help to reduce difficulties they have at school. CVD can also limit career choices. In the UK, there are restrictions for people who want to become pilots, enter the police force or be train drivers. However, if you have CVD you can still drive a car, motorbike, bus or lorry. Unfortunately, there’s not yet any cure for inherited CVD, but there is help available, ranging from special tinted glasses to apps and device settings. It can be difficult to detect CVD, especially in its milder forms. A child that is taught the sky is blue or roses are red might appear be able to identify these colours even if they can’t actually see them. Testing for CVD is not part of a routine eye test, but can be carried out if requested if a parent a teacher suspects a child might have CVD or notices that their colour perception. Thank you to the The Colour Blind Awareness organisation who provided the simulations for this article. The organisation has a wealth on information on CVD, from the causes and symptoms to advice and support. Samsung has launched an app that makes watching TV a more vibrant experience for people with color vision deficiency (CVD).